The use of mass spectrometry in forensic science is a growing field. Direct Analysis in Real Time (DART) mass spectrometry is currently being used to detect trace amounts of drugs collected from crime scenes. This analysis of DART-MS is beneficial because a large sample quantity is not required for this presumptive testing. Research performed under Dr. David Cunningham in the past has focused on strategies to obtain a large amount of signal from known samples of methamphetamine and internal standard. 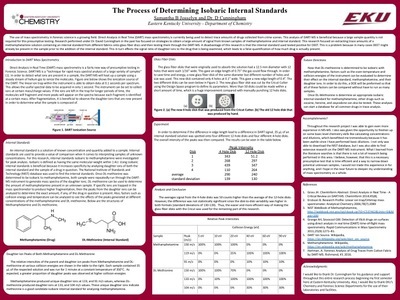 This research focused on extracting trace amounts of a methamphetamine solution containing an internal standard from different fabrics onto glass fiber discs and then testing them through the DART- MS. A disadvantage of this research is that the internal standard used, the insect replant DEET, might already be present on the sample prior to the addition of the internal standard. When DEET is already present, the sample/standard peak area ratio used in quantitation would be lower resulting in a falsely lower assay value. In the present research, isobaric internal standards are found that have different daughter ion peaks than methamphetamine which substantially increase the selectivity of the method.